Easy to use tools to create professional 3D & 2D floor plans. 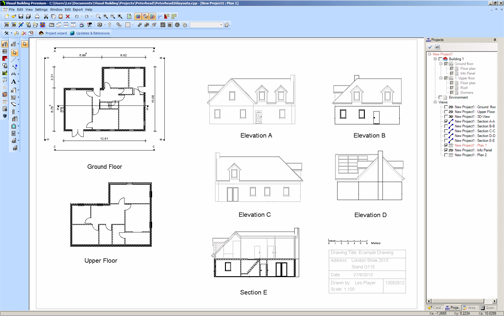 Visual Building is a CAD application specific to the construction of buildings and is suitable for Architects, Builders, Interior Designers, Selfbuilders Home owners - in fact anyone that wishes to create and maintain building floor plans. You pay no subscription and there is no contract just a one-off cost. To see how Visual Building can help you, identify and select your User Profile from the left panel. Has been developed as a easy to use design and visualisation tool for self builder,extentions..
March 2019: New! Visual Building Version 7.0.0.8 released. Our new Version 7 is now available. April 2017: New! Visual Building Version 6.1.0.0 released. Our new version 6 is now available. March 2016: New! Follow the FREE Visual Building Training Course. New! FREE Tutorial Videos Especially for the new user. We also have a large set of tutorial videos that quickly demonstrates the powerful features of Visual Building. Create your Floor plans today. Jan 2016: New! new intuitive Ribbon interface. Visual Building release 5.0.0.2 includes the new intuitive Ribbon interface (like Microsoft Office), possibly making it the easiest 3D home design software tool to learn and use. You also have the option to toggle between the classic toolbar user interface and the new ribbon user interface. As of 5.0.0.1 the software language options now include English (default), German , French, Italian, Dutch, Polish, Russian, Slovak and Spanish. Watch our tutorial on how quickly you can create your dream home. Wheather your buying the product to design a whole build, a extension on a exsisting property or to market your property Visual Building range is fast, easy and gives you professional results. We offer discounts on upgrades on are Visual Building products for exsisting users. If you need 2D / 3D home design software, then you should try Visual Building. Whichever version you choose, you can always upgrade later without concern of loss of data, features or investment or the need to learn a new software.